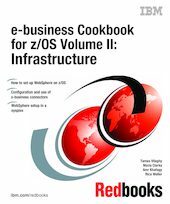 This IBM Redbooks publication is the second volume in the "e-business Cookbook for z/OS" series. It is intended for System Programmers involved in setting up and configuring an environment to run Java-based e-business applications on z/OS and OS/390. We focus on the most popular and viable application topologies. Software products covered are z/OS UNIX System Services, TCP/IP, IBM HTTP Server for z/OS, IBM WebSphere Application Server for z/OS V4, and the Java connectors for DB2, CICS, MQSeries and IMS. We also detail how to set up and run WebSphere in a Parallel Sysplex environment. The information in this book will help you configure an environment on z/OS that will be ready to implement end-to-end e-business solutions using Java, WebSphere and traditional backend systems. We also provide information on security aspects and performance optimization regarding many of the products. The other volumes in this series are e-business Cookbook for z/OS Volume 1: Technology Introduction, SG24-5664, and e-business Cookbook Volume III: Java Development, SG24-5980.